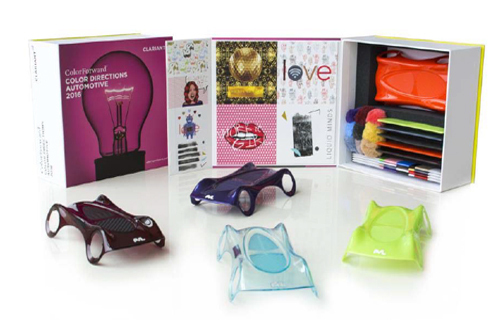 Muttenz, March 18, 2015 – Clariant, a world leader in specialty chemicals, is introducing automotive engineers to ColorForward®, the color forecasting guide for the plastics industry during the Plastics in Automotive Engineering Congress sponsored by VDI, the society of German engineers. The event takes place in Mannheim, March 18 and 19. Clariant’s ColorWorks® offers traditionally two versions of ColorForward: one aimed at designers of solid plastic components and the other, ColorForward Interiors, which is addressed to users of fibers and textiles. The goal of both versions is to help designers and marketing professionals make more informed color choices. Each edition presents four global societal trends that can be expected to influence consumers’ behavior. The international team of Clariant specialists then selects different colors or color combinations that evoke an emotional response related to each trend. Annually surveying global trends and week-long creative workshops are important elements in the broader selection process which involves collaboration between plastics and color specialists, industry and consumer-science experts and designers and product marketers from all end markets,all around the world. Starting from this solid root, this year a new member joins the ColorForward family: ColorForward Automotive, specifically addressed to the needs of the automotive design. ColorForward springs from the minds and experience of an international team of color, design, marketing and polymer experts, representing multiple creative industries from all over the world. Each edition presents four global societal trends that can be expected to influence consumer behavior. Each trend is then represented by five colors that capture the essence of that trend. In the original ColorForward, the colors are presented in molded plaques made of various plastics, rigid and flexible, opaque and translucent. ColorForward Interiors presents the colors as pompons made of polypropylene (PP) and polyamide (PA) fibers, but also “wrap cards” with polyester fiber samples- forms that are very familiar to developers and users of fabrics, carpeting and upholstery. ColorForward Automotive 2016 blends some of the elements of the other two members of the family and adds on top of that a totally new way of illustrating appearance in plastic: large, textured plaques, manufactured internally at Clariant Masterbatches Automotive lab in Europe, very familiar to professionals in the field, and, in close cooperation with Plastivaloire, injected design cars, the latter offering the possibility to appreciate the colors not only on a large surface, but also on a complex geometry. “Along the years, we have captured the interest from design departments of the Automotive OEMs around our ColorForward forecasting tool, and translated it into a more specific sample presentation, where colors and polymers selected are more meaningful for the automotive industry.” explains Laura Carrillo. Love… is spelled with a Wi-Fi symbol inside the ‘o’ to represent the ways in which technology a human life have merged. Immersed in the cloud, wirelessly connected sensors track personal health and even create new connections between people. We access medical information, monitor vital signs and depend on devices to help carry out even the simplest of tasks. Technology has become an invisible, yet caring, family member.Love… is spelled with a Wi-Fi symbol inside the ‘o’ to represent the ways in which technology and human life have merged. Immersed in the cloud, wirelessly connected sensors track personal health and even create new connections between people. We access medical information, monitor vital signs and depend on devices to help carry out even the simplest of tasks. Technology has become an invisible, yet caring, family member.